Just a short stroll from Cape Tribulation's beach and famous mangrove board walks, Ferntree Rainforest Lodge is a superb, yet affordable tropical getaway. This is the only place on earth where two World Heritage-listed environments live alongside each other. On one hand, the extraordinary tropical underworld of the Daintree Rainforest. On the other, the sparkling turquoise of the Great Barrier Reef. Ideally located in the heart of this unusual harmony is your hideaway, Ferntree Rainforest Lodge, where a rare nature lovers’ paradise awaits you. Go bush walking, horse riding, kayaking, snorkelling, fishing in the estuaries, or simply unwind in one of Australia's most beautiful, untouched settings. The dense rainforest reaches all the way down to the coast from rugged mountains rising in the west, with ancient, exotic plant life bordering the waterfalls and clear jungle streams. The rainforest is home to some of the oldest species of ferns in existence, including the renowned Angiopteris, the largest in the world. Set harmoniously within the vivid green landscape, Ferntree Rainforest Lodge's magnificent gardens are designed to attract some impressive rainforest creatures. From the comfort of your room, you can witness the operatic display of colourful butterflies and birds, as they dance in the dappled sunlight of this spectacular environment. It would be hard to find a better place to delight, inspire and refresh. So come and experience the beauty and wonder of Ferntree Rainforest Lodge. Hotel room with a spacious living and sleeping area, ensuite facilities with combined bath and shower, A/C, phone, fridge & an upstairs private balcony overlooking the lagoon-style pool. Bedding is a King size bed (or 2 Single beds on request). Two hours north of Cairns, across the Daintree River, lies one of the few unspoilt paradises left on Earth. The only place in this World where two World Heritage listed National Parks join. The Cape Tribulation section of the Daintree Rainforest is where the planet's most ancient rainforest, The Daintree, meets the Great Barrier Reef. Follow in the footsteps of Sir David Attenborough who stayed here at the Heritage Lodge Resort while filming "The Life of a Plant". He described his time here in the Daintree as "one of the most magical experiences in my life". Daintree-Cape Tribulation Heritage Lodge & Spa is not just a resort offering accommodation, it is an experience! Unpretentious, yet with all the facilities you'll find in far more expensive resorts, the Daintree Heritage Lodge and Spa offers wonderfully comfortable, air conditioned 3.5 star affordable cabins nestled within the rainforest and surrounded by the World Heritage Listed Daintree and the neighboring Great Barrier Reef. Within two minutes are gorgeous local beaches you can have almost all to yourself. Enjoy guided and unguided rainforest walks close to hand, and horse riding and crocodile tours nearby. Warm, friendly hosts will share their passion for this unique environment and help you get the most out of your stay. Lose track of time. Breathe in the fresh, moist rainforest air. Swim with turtles and jungle perch in crystal clear streams. Awaken to the sound of birds and frogs. Immerse yourself in the sights and sounds of this ancient forest. Experience an area unlike any other, where yours are the only footprints on an idyllic beach; where you'll feel that you've travelled back millions of years in time to be amongst primeval jungle. Enjoy a romantic escape in one of the Deluxe Rainforest Cabins, which features a Queen Size Bed, balcony, DVD player and private ensuite bathroom or treat yourself in one of the heavenly Honeymoon suites, complete with Queen Size Bed, lounge room with DVD, private ensuite bathroom with bath and private access to some of the resorts most beautiful crystal clear swimming holes. Why not bring the whole family and relax in the family cabin which can accommodate up to five people. The rainforest cabins have been designed to blend into the beautiful natural surrounds of the picturesque Daintree Rainforest. They are all non smoking and air-conditioned, with private ensuite bathrooms and high ceilings as well as fully screened, louvered windows which open directly to the rainforest. ALL GUEST ACCOMMODATION INCLUDES FREE CONTINENTAL BREAKFAST EACH MORNING!!! In keeping with the feel of the resort, there are no telephones in the cabins, nor mobile phone coverage in the area, however there is a phone available for use in reception. With 1km of crystal clear fresh water swimming holes, private rainforest walking tracks, a licensed restaurant and bar as well as a Day Spa and 5 minutes from tropical beaches, Heritage Lodge & Spa in the Daintree is the perfect base from which to explore this amazing wilderness. Further facilities include outdoor swimming pool, BBQ facilities, bicycle hire, FREE car parking, tropical gardens and courtyard, equipment hire, daily housekeeping, express check out, faxing facilities, ice machine, guest laundry, masseur/masseuse, outdoor furniture, pets not allowed, sun deck and tour desk. DVDs and books are available free of charge from the library in reception. The Deluxe Queen Cabin has been designed to blend into the beautiful natural surrounds of the picturesque Daintree Rainforest. The cabin is spacious and newly refurbished, non smoking and air-conditioned with high ceilings and fully screened, louvered windows which open directly to the rainforest. The cabin further offers 1 Queen Size Bed, a private ensuite bathroom with shower, hairdryer and toilet, a private balcony, colour TV, DVD player, a free selection of DVD movies, alarm clock, bar fridge, tea & coffee making,facilities and ceiling fan. The rate is for 2 guests. The cabin caters for a maximum of 2 guests. Daily housekeeping is available at extra charge. Please note that the RATE INCLUDES FREE CONTINENTAL BREAKFAST FOR ALL GUESTS!!! The Honeymoon Queen Suite has been designed to blend into the beautiful natural surrounds of the picturesque Daintree Rainforest. The suite is non smoking and air-conditioned with high ceilings and fully screened, louvered windows which open directly to the rainforest. It is luxurious, spacious and newly refurbished, featuring private access to crystal clear and private swimming hole. The suite further offers 1 Queen Size Bed, a very large private ensuite bathroom with seperate bath, shower, hairdryer and toilet, a private balcony, colour TV, DVD player, a free selection of DVD movies, alarm clock, bar fridge, tea & coffee making,facilities and ceiling fan. The rate is for 2 guests. 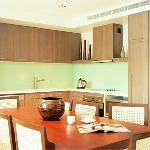 The suite caters for a maximum of 2 guests. Daily housekeeping is available at extra charge. Please note that the RATE INCLUDES FREE CONTINENTAL BREAKFAST FOR 2!!! The Standard Queen Cabin has been designed to blend into the beautiful natural surrounds of the picturesque Daintree Rainforest. The cabin is non smoking and air-conditioned with high ceilings and fully screened, louvered windows which open directly to the rainforest. The cabin further offers 1 Queen Size Bed, a private ensuite bathroom with shower, hairdryer and toilet, a private balcony, colour TV, DVD player, a free selection of DVD movies, alarm clock, bar fridge, tea & coffee making,facilities and ceiling fan. The rate is for 2 guests. The cabin caters for a maximum of 3 guests. The extra guest will be accommodated on a Single Bed at the extra guest rate of $10.00 per night. Children under 3 stay FREE OF CHARGE if using existing bedding. Daily housekeeping is available at extra charge. Please note that the RATE INCLUDES FREE CONTINENTAL BREAKFAST FOR ALL GUESTS!!! Club Crocodile Hides Hotel offers accommodation right in the city centre of Cairns. The wide colonial verandas that front the building provide a unique vantage point to view the city of Cairns, and provides you with a relaxing place to enjoy your FREE Continental Breakfast. Everything that Cairns has to offer is situated within easy walking distance from the Hides Hotel Cairns. A 3.5 star Hotel room featuring ensuite bathroom, TV, air-conditioning, tea/coffee making facilities and a fridge. A Free Continental Breakfast is also included in the hotel rates. A Heritage Budget Hotel rooms at the Hides Hotel Cairns feature a colour TV, air-conditioning, tea/coffee making facilities and fridge. These rooms have communal bathrooms and showers and guests receive a Complimentary continental breakfast served on the verandah at Hides. A 3.5 star Motel room with a double & single bed, ensuite, TV, tea/coffee making facilities, air-conditioning & a fridge. The rate also includes a FREE continental breakfast served on the verandah at the Hides Hotel Cairns. Centrally located in the heart of Cairns. Rydges Plaza Cairns is the closest hotel property to the Cairns Convention Centre, Reef Casino, Great Barrier Reef departure terminals, Esplanade Lagoon, Foreshore Promenade and Cairns Central shopping complex. All of the attractions of Tropical North Queensland are at your door, while the hotel puts all the facilities of a four star hotel at your fingertips. Rydges Plaza Cairns is perfect for business and perfect for pleasure. Enticing rooms, spacious suites, stylish facilities and enthusiastic committed staff make your stay at Rydges Plaza Cairns . Spacious City View rooms located on the upper floors of the hotel feature 1 Queen Rydges Dream Bed, comfortable double sofa, private step out balconies, an ergonomic work station complete with hi-speed broadband internet in all rooms, Also boasting 6 Austar channels, fully stocked mini bar, iron & ironing board, in-room safe and complimentary tea & coffee making facilities. 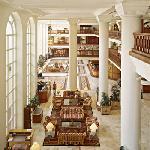 Full Buffet Breakfast for 1 person, Free Internet for 24 hours, Free Newspaper AND Free Espresso coffee with breakfast. Spacious City View rooms located on the upper floors of the hotel feature 1 Queen Rydges Dream Bed, comfortable double sofa, private step out balconies, an ergonomic work station complete with hi-speed broadband internet in all rooms, Also boasting 6 Austar channels, fully stocked mini bar, iron & ironing board, in-room safe and complimentary tea & coffee making facilities. Spacious City View rooms located on the upper floors of the hotel feature 1 Queen Rydges Dream Bed, comfortable double sofa, private step out balconies, an ergonomic work station complete with hi-speed broadband internet in all rooms, Also boasting 6 Austar channels, fully stocked mini bar, iron & ironing board, in-room safe and complimentary tea & coffee making facilities. Package includes full buffet breakfast for two adults. These spacious rooms feature a Queen Rydges Dream Bed, private step out balconies and an ergonomic work station complete with hi-speed broadband internet in all rooms. Also boasting 6 Austar channels, fully stocked mini bar, iron & ironing board, in-room safe and complimentary tea & coffee making facilities. Movie package includes full buffet breakfast for two people and two movie passes. These spacious rooms feature a Queen Rydges Dream Bed, private step out balconies and an ergonomic work station complete with hi-speed broadband internet in all rooms. Also boasting 6 Austar channels, fully stocked mini bar, iron & ironing board, in-room safe and complimentary tea & coffee making facilities. These spacious rooms feature a Queen Rydges Dream Bed, private step out balconies and an ergonomic work station complete with hi-speed broadband internet in all rooms. Also boasting 6 Austar channels, fully stocked mini bar, iron & ironing board, in-room safe and complimentary tea & coffee making facilities. Package includes full buffet breakfast for two adults. The Great Northern Hotel is a quiet, 33 room boutique hotel with perfect inner city location. All tours pick up from the hotel front door. Shopping, dining and entertainment is within meters of the hotel. Reception and Tour desk is open 24 hours a day and our friendly staff is here to provide you with a superior personal service. Recommended by Lonely Planet, The Great Northern Hotel features a quiet in-house bar and offers a healthy buffet breakfast daily. At the Great Northern Hotel we cater for travellers, holiday makers and corporate clients. A wireless high speed internet connection and internet café in the bar. Every room has telephone, TV, fridge, coffee/tea, private ensuite bathroom, carpet floors and more and will ensure you have a comfortable and pleasant stay, whether you’re here on business or leisure. FREE continental & Chinese BREAKFAST,wireless,CBD .Hotel room featuring TV, AC, tea/coffee making facilities and fridge. INC bathrooms and showers.Rates are for ONE(1) people only. Maximum occupancy is 2. Bedding configuration is one double bed or two single beds Extra guest charge is $20 per person per night.$10/per night for child. wireless,CBD .Hotel room featuring TV, AC, tea/coffee making facilities and fridge. INC Rates are for ONE(1) people only. Maximum occupancy is 2. with wireless, in CBD.Bedding configuration is one double bed or two single beds. Extra guest charge is $20 per person per night. $10/per night for child. FREE continental or Chinese BREAKFAST,wireless,CBD.The Standard Double room will have a Queen size Bed. The Standard Twin room may have 2 x Single Beds or 1 x Double size Bed and 1 x Single Bed. All rooms have ensuite bathroom and air-conditioning. Rates are for 2 people only..Extra guest charge is $20 per person per night.$10/per night for child. Rated No 1 in the Daintree! Only Douglas Enviro AWARD retreat on Daintree coast. Comfy tropical room with tropical decor featuring 1 Queen Bed & 1 single sofabed, night tables, private ensuite bathroom with shower and toilet, kitchenette with microwave, tea & coffee making facilities, fridge, toaster and china/cutlery, lounge furniture, coffee table, TV, DVD player, CD player, desk, dial-up internet access, insect screens, ceiling fan, 24 hour power, alarm clock, radio, ironing equipment, laundry facilities including washing machine and dryer, hairdryer and a spacious verandah with comfy chairs overlooking tropical gardens. Rate is for 2 guests. Maximum 3 guests. Extra guest charge is $20 per guest per night. Please note - 10% Discount at the Restaurant and on tours to the Great Barrier Reef. Cots are available at extra charge. The Fan Palm Queen Suite overlooks the delightful tropical garden. Rated No 1 in the Daintree! Only Douglas Enviro AWARD retreat on Daintree coast. Comfy Tropical room with tropical decor featuring a Queen Bed & Single Bed Private ensuite bathroom, lounge furniture, coffee table, TV, Internet access.fridge, insect screens, ceiling fan, 24 hour power, alarm clock, radio, ironing equipment, laundry facilities including washing machine and dryer, hairdryer and a spacious verandah with comfy chairs overlooking tropical gardens. Rate is for 2 guests. Maximum 3 guests. Extra guest charge is $20 per guest per night. . Includes Light Tropical B'fast. Cots are available at extra charge. NO COOKING IN THIS ROOM & NO USE OF FREE BBQ. THIS ROOM HAS ONLY TEA & COFFEE MAKING FACILITIES NO SELF CATERING. This Cairns hotel is located within walking distance to the city centre of Cairns and major shopping centre. The spacious hotel rooms have modern decor located around central swimming pool and spa, amid lush tropical garden. Most of the accommodation rooms have a balcony or verandah area to enjoy our climate all year round. There is also a restaurant and bar on property providing room service or dine in. The Cairns Rainbow Resort has a central salt-water swimming pool and spa with a cascading waterfall that is framed by a lush tropical garden with swaying palms and coconut trees. The perfect accommodation environment in which to relax and unwind. 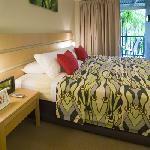 3.5 Star Boutique Style Motel, located close to city and airport and Cairns major shopping centres. Maximum 3 adults per room, Extra person $20 each. All rooms have air-conditioning, ensuite, mini bar, balcony, Austar and internet access, located either on first or second floor. On site car parking is available. We offer tour desk services and our friendly staff with their wealth of local knowledge can assist you to see and do the best that Cairns has to offer. We also have hire cars available for self drive. Located only 1 hours scenic drive north of Cairns and 5km from the town centre of Port Douglas, Sea Temple Resort & Spa Port Douglas combines luxury and first class service to create a haven of privacy and relaxation, and is set on almost 10 acres of tropical beachfront at the southern end of Four Mile Beach. With the Great Barrier Reef, Daintree Rainforest and Cape Tribulation all on your door step, Port Douglas is the gateway to a magnificent display of Australia's natural beauty. Offering luxuriously spacious and beautifully detailed accommodation in Port Douglas, choose from a range of studio, 2 & 3 bedroom apartments, beach retreat villas, penthouses with private rooftop spa, swim-out apartments with direct access to meandering lagoon pool or private plunge pool apartments. Sandstone, timber, flowing fabrics and glass combine to create an atmosphere of calm and tranquillity with a balmy, seductive ambience. Enjoy the decadence of our specially designed Day Spa with 8 indulgent treatment rooms. The uniquely designed Temple Restaurant offers a wide range of dining styles, with an ambience designed to encourage relaxation. The combination of fresh local produce and our creative kitchen team allows us to deliver a memorable dining experience, with the restaurant menu changed seasonally with a variety of daily specials. These modern & spacious fully self contained apartments are ideal for the longer staying traveller, including a fully equipped kitchen, laundry facilities & stylish outdoor furnishings. Also boasting daily housekeeping service at NO extra cost! The perfect room for a romantic getaway or for those who just want to escape! This "Resort style" room features an indulgent king size private Spa Bath as well as Minibar on request and complimentary Tea & Coffee making facilities. Not just an ordinary hotel room! Stay & Pamper Package includes accommodation in a Studio Spa Room and 60 minute Aroma Massage for 2 at MiiSpa Port Douglas! Reservations essential, please call MiiSpa once you have made your reservation. MiiSpa can be contacted on the phone number provided on the booking confirmation letter under Reception Phone number. The perfect room for a romantic getaway or for those who just want to escape! This "Resort style" room features an indulgent king size private Spa Bath as well as Minibar on request and complimentary Tea & Coffee making facilities. Not just an ordinary hotel room! Stay & Play Package includes accommodation in a Studio Spa Room and 18 holes of Golf for 2 people at the Sea Temple Golf & Country Club. The perfect room for a romantic getaway or for those who just want to escape! This "Resort style" room features an indulgent king size Spa Bath for you to enjoy. This package also includes a Full Buffet Breakfast in Aqua Restaurant by the Lagoon Pool! The perfect room for a romantic getaway or for those who just want to escape! This "Resort style" room features an indulgent king size private Spa Bath as well as Minibar on request and complimentary Tea & Coffee making facilities. Not just an ordinary hotel room! Address : 2 Loretta ave, Cairns, QLD, 4868. AAA 4 star rated Hotel Rooms are fully air conditioned with a cool tropical feel. Rooms contain a queen size bed with private balcony/patio, private ensuite, tea/coffee making facilites and a Flat Screen LCD TV with Austar. The Hotel Cairns is centrally located just 1 block from the city centre of Cairns and 5 minutes drive from the Cairns International Airport. The Cairns Hotel is reminiscent of the tropical 'Queenslander' style properties that provides a true experience and tropical ambience. The air-conditioned hotel rooms offer you superior accommodation with cool tiled floors and ceiling fans. Many of the hotel rooms offer a balcony and all of them have a window or door to allow the cool sea breezes to flow through. They also feautre flat screen TVs, DVD players, plump beds, sizeable baths and precious touches like indulgent bath products and quality teas and coffee. Enjoy a Tropical 'Queenslander' setting, over looking the pool and Tropical gardens in a Plantation Room right in the centre of Cairns one block from The Esplanade. Rates are based on single, double or twin share. This exclusive luxury retreat caters for a maximum of only 8 discerning guests at any one time. The Quality Inn Rainbow Southside provides spacious motel rooms with traditional teak timber decor and quality fittings, electronic security locks, voice mail, conference room, swimming pool with children's crocodile slide and a popular Seafood restaurant and bar. This Cairns hotel accommodation also has a guest laundry for your convenience and hire cars are available. The friendly office staff can help with your day tour bookings, most with free pick up and drop off at the door. Being just 3 kms from the the Cairns City Centre and 6 kms from the Cairns domestic and international airports the Quality Inn Rainbow Southside is ideal hotel accommodation for both the corporate and domestic traveller. All 246 rooms are superbly appointed, reflecting the tropical style of the region. All rooms are non smoking and open out onto a private balcony. Ashtrays are provided on all balconys. Located on The Esplanade and five minutes from the new Cairns Lagoon, city centre, restaurants, shopping and departure points for the Great Barrier Reef. Guests have complimentary use of the Health Club at Rydges Esplanade Resort, 400 m walk. 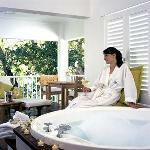 Spacious rooms with some featuring their own private balcony with tranquil views of the tropical resort pool or gardens. Each room features private facilities, writing desk and a choice of bedding configuration. ($40 Extra person charge applies) Rates are for 2 adults. Maximum occupancy is 3 adults or 2 adults & 2 children (children 0-12 stay free in existing bedding). Extra adult is $40 per night. Bedding is either 2 double beds or 2 single beds. Please state bedding preference in reservations. Stylish and modern hotel room with tea & coffee making facilities, private balcony, air-conditioning, ceiling fans, direct dial phones, broadband internet access, colour television and working desk. Capture the casual lifestyle of tropical North Queensland without compromising on style or comfort at the Pullman Cairns International - a haven for relaxation where colonial charm meets tropical elegance. Subtle, unobtrusive yet impeccable attention awaits. The hotel is located in the heart of Cairns, just a short stroll from the Convention Centre, Casino & Trinity Wharf - the departure point for cruises to the Great Barrier Reef. 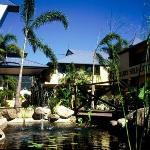 Heritage Cairns is a modern, contemporary hotel, which opened in 2002 and is situated right in the heart of Cairns. This superb modern hotel is centrally located only 10 minutes from the Cairns airport and a a short stroll from the world class, recently revamped and exciting Cairns Esplanade and only 3 blocks from the Cairns city centre. The professionally trained staff will greet you with a genuine warm and friendly welcome with a smile. At the The Heritage Hotel Cairns, the people who run the place own the place — we specialise in offering friendly "family" hospitality. The professional, dedicated and friendly staff are more than happy to provide you with local knowledge of where to eat, where to shop or where to party and can provide advice on all local attractions. We will gladly book any tours free of charge. 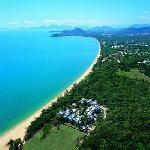 We pride ourselves on doing our best to offer you a fantastic time in Tropical North Queensland. With its balmy year-round climate, great facilities and charming lifestyle, it's easy to see why Cairns is one of Australia's top visitor destinations. This modern cosmopolitan city sits on the shores of a natural harbour with a backdrop of rainforest-clad mountains, and provides front-door access to World Heritage-listed reef, rainforest and outback. West of Cairns lie the cool tropical wetlands of the Atherton Tablelands, while south are the mountains, rainforest and waterfalls of Wooroonooran National Park, part of the Wet Tropics World Heritage Area. The Heritage Cairns, a member of the Golden Chain Group of hotels/motels, is a 45 room non smoking hotel, ideally located near Cairns shopping, business and leisure activities. All guest rooms are non smoking and air conditioned. You will find the rooms clean and comfortable. All rooms are serviced daily to the highest standard. If you are a business traveller and want to keep your clothes unrumpled from our tropical climate, we provide an iron and ironing board in every guest room as well as fully stocked minibar and fridge so you can unwind at any time of day. Featuring free movie channels 24/7, the spacious accommodation further comprises your choice of either King sized bed or 2 Single beds, wireless internet access, refrigerator, colour TV, writing desk and chair, private ensuite bathroom and tea/coffee making facilities. Local Restaurant charge back is available upon request. Gourmet deliveries also can be arranged. Breakfast is room service only. All the facilities one expects from an International class hotel are right here. Luggage can be stored FREE for convenience of early arrival or late departure. We also offer late check out for late departures (fees may apply and is subject to availability). The Heritage Cairns features an outdoor pool and spa ensuring your stay is as relaxed as can be. Enjoy your very own cooking in our outdoor BBQ area. If you prefer to dine out, you are within easy walking distance of a multitude of great restaurants. The quiet location affords close city proximity without the city noise. The Heritage Cairns is a great base from which to explore the wonderful sights and experiences of the Tropical North. Enjoy many of Cairns favourite attractions within easy walking distance. Whether you are after an ultimate adventure on the Great Barrier Reef or have always wanted to white-water raft, this property is an ideal base to explore everything. The Tour desk has all the information at their fingertips to choose your adventure. Tour Pick up service is available from the front door. The Convention Centre is but 10 minutes away with the Cairns Civic Theatre being just a few minutes walk. The Calvary Hospital is one street over and the Cairns Base Hospital is nearby. Stay at the Heritage and experience the difference. The Heritage Queen/Twin Room is non smoking and spacious, with an array of convenient amenities to make you feel right at home. The room comprises air conditioning, either 1 Queen bed(1 King Bed is available, subject to availability, please specify request in the Special Requests Section of your Booking) or 2 Single Beds (please specify requirement for 2 Single Beds in the Special Requests Section of your Booking), private ensuite bathroom with shower, alarm clock, mini bar, radio, balcony/courtyard, desk, dial-up internet, hairdryer, iron & ironing board, colour TV, satellite / cable TV, tea/coffee making facilities, bar size refrigerator and Wireless / WiFi internet access. A DVD player is available on request - free of charge! The rate is for 2 guests. maximum occupancy is 2 guests. The Tropical King Suite is non smoking and spacious, with an array of convenient amenities to make you feel right at home. The suite features a separate spacious and furnished sitting room with 2 seater sofa and armchair, writing desk, chair and coffee table, air conditioning, a seperate bedroom with 1 King Bed,plus 1 single bed in main area private ensuite bathroom with shower, kitchenette with microwave, worktop, sink, table and chairs, alarm clock, radio, balcony/courtyard, Broadband internet access, desk, dial-up internet, hairdryer, iron & ironing board, separate spacious sitting room with couch & tub chair, colour TV, satellite / cable TV, ,tea/coffee making facilities, bar size refrigerator and Wireless / WiFi internet access. A DVD player is available on request - free of charge! The rate is for 3 guests. Maximum occupancy is 4 guests. Extra guest charge is $25 per guest per night. Ideal for Business or Leisure. Cairns Queens Court is ideally located, a short walk to the Cairns Esplanade, city shopping, restaurants and tourist facilities. Complimentary airport, bus and train station pick up available from 7am to 5pm daily. Return transfers at select times, excluding public holidays. All of the hotel rooms are non smoking and are serviced daily.The Cairns Queens Court offers evening bistro dining in it's own restaurant. Cairns Queens Court is centrally located within the city centre. A 10 minute walk brings you all the city’s attractions and holiday makers’ requirements. The knowledgeable and friendly staff at the Cairns Queens Court 's tour desk will be pleased to assist you in selecting your tours to Port Douglas, Cape Tribulation, The Great Barrier Reef, and the famous World Heritage listed rainforest. Studio Suite 4 Star Deluxe spacious with modern decor choice of king/queen or single bedding. Rate for 2 people max 3 extra person $30.00. Facilities include cooktop, microwave, large fridge, dining area, rooms have ceiling fans, balcony, cable tv,room safe free broadband internet includes continental breakfast daily, courtesy pick up at select times, rooms serviced daily. Nestled amongst an acre of lush tropical gardens in the very heart of Cairns, you will enjoy the superb location and comfort of this family owned boutique hotel, the Bay Village Tropical Retreat and Apartments ... hotel and apartments resort accommodation specialising in that personal touch. The resort style surrounds make the Bay Village Tropical Retreat and Apartments a perfect base to discover the region's natural wonders of reef, rainforest and outback. The Bay Village Tropical Retreat and Apartments is centrally located right in the heart of Cairns, just one block (3 minutes walk) from the popular Cairns Esplanade Waterfront and only 900 metres (15 minutes walk) from the City Centre. Cairns is the gateway to the Great Barrier Reef and an ideal base to explore Tropical North Queensland, offering the stunning World Heritage rainforest and coral reefs and extraordinary tropical scenery. Take a historic rail journey to Kuranda in the mountains, ride the world's longest cable car above the rainforest, explore the Daintree Rainforest, take a boat trip to the Great Barrier Reef and snorkel, learn to scuba dive or see the spectacular underwater world from a glass bottom boat. Day tours to most parts of the Tropical North leave daily and include transfers to and from the Bay Village Tropical Retreat and Apartments. Above all - don't forget your camera. Experience a truly South Pacific lifestyle. A former gold rush port, Cairns has wide tree lined streets with designer shops, gourmet restaurants and traditional pubs. It is casual and relaxed with 300 days of sunshine a year. Cairns is blessed with an abundance of local delicacies: fresh seafood from the ocean; tempting exotic tropical fruits from the Tablelands and the piquant flavours of native Australian cuisine. The Bay Village Tropical Retreat is a family-owned retreat with 2 levels, offering personalised service and value for money. Sit back and soak up the relaxed informal atmosphere in the award winning gardens. On offer are a a number of room types featuring cool tiled floors, natural colours and surfaces, tropical fabrics and local rattan furniture. With some of the largest fully serviced rooms in Cairns, Bay Village Tropical Retreat caters for everyone! After extensive renovations Bay Village now offers Queen/Twin Rooms, one Bedroom Suites, 2 Bedroom Apartments and 3 Bedroom Apartments. All guest accommodation offers private bathrooms with showers, Queen Size and/ or Single Beds, individual air conditioning, ceiling fans, colour TVs, ISD/STD telephones, internet access, refrigerators and tea/coffee making facilities to ensure a comfortable stay. The 2 and 3 bedrppm apartments are fully self contained with full kitchens, laundries, spacious balconies and living areas and Cable TV. This resort style property boasts a free form swimming pool, poolside cocktail bar, BBQ facilities and fully licensed a la carte Balinese Restaurant - the Bay Leaf. Enjoy the best food and boutique wines in an open air setting amid tropical surrounds. A true blend of flavours from land and sea, you can be assured of a unique and affordable culinary adventure. Further facilities include a guest laundry, courtesy airport transfers (07.00am - 7.00pm), internet room for guests, Free on site car parking, a tour desk, safety deposit, room service, concierge, dry cleaning/laundry service and personalised service. The 3.5 Star 1 Bedroom Apartment is a semi self contained 1 bedroom apartment suite comprising 1 Queen Size Bed in the seperate bedroom, private ensuite bathroom with shower, seperate small and stylish living area, kitchenette with limited cooking facilites including a microwave,refrigerator and tea/coffee making facilities, air-conditioning, colour television, desk, dial up internet access, ceiling fan, hairdryer, in room telephone, opening windows, alarm clock and radio. The rate is for 2 guests. Maximum 2 guests. Cots are available at extra charge. A child under 12 years of age may stay free of charge if sharing with 2 adults and using existing bedding. The 3.5 Star Queen/Twin Room is a spacious room comprising either 1 Queen Size Bed or 2 Single Beds ( please specify preference in the Special Requests Section of your Booking), private ensuite bathroom with shower, air-conditioning, colour television, desk, dial up internet access, ceiling fan, hairdryer, in room telephone, refrigerator, opening windows, alarm clock, radio and tea/coffee making facilities. The rate is for 2 guests. Maximum 3 guests. Extra guest is $25.00 per night. Cots are available at extra charge. A child under 12 years of age may stay free of charge if sharing with 2 adults and using existing bedding. Comfort Inn Canon Park Cairns provides discount hotel accommodation within walking distance of shops and restaurants. The Cannon Park Race Course is also located opposite the motel. The picturesque Cairns Foreshore is within an easy 15-minute drive. All of the hotel rooms are well appointed and feature air conditioning, ceiling fan, daily room service, austar television, latest movies on MovieLink. This quality Cairns hotel has a swimming pool, and guest laundry, secured allocated carpark and wireless internet. At the Comfort Inn Cannon Park Hotel Cairns you will enjoy a friendly, relaxed atmosphere with the latest in modern accommodation facilities to make sure that your stay is a comfortable, enjoyable and memorable one. Queen size bed, Table with 2 chairs Writing/Make-up desk with chair En suite with shower above hip bath Roll-away can be added at a fee. Between the extraordinary tropical underworld of the Daintree Rainforest and the sparkling turquoise of the Great Barrier Reef at Cape Tribulation - a true paradise and one of the world's most remarkable environments. Both the Daintree and the Great Barrier Reef are World Heritage-listed sites. Thriving with native fauna, the ancient forests of the Daintree are also home to 85 of the world's 120 rarest species of plants - a living museum that has barely changed in thousands of years. The Barrier Reef is the world's largest coral formation, comprising nearly 3,000 reefs, with 400 different kinds of coral. Its waters teem with spectacular marine life. Scuba diving, snorkelling, 4WD trips, horse riding, rainforest walks and crocodile cruises are just some of the activities on offer. If you’re feeling adventurous, embark on a kayaking tour from Cape Tribulation beach, or for the not-so-adventurous, languish by the pool or at the beach. Even though you have all these adventures on your doorstep, at Coconut Beach Resort, you'll still be holidaying in luxury. Our guests unwind in the most exquisite natural surroundings, without sacrificing any creature comforts. You'll find four-star Cape Tribulation accommodation amidst the wilderness, offering private rainforest views, with easy access to pristine Coconut Beach. At night, take the nocturnal rainforest walk to see some amazing wildlife out and about. Generously spacious, with polished timber floors and elegant interiors, all rooms are furnished with stylish, luxurious appointments. Daintree Retreats also feature exclusive touches such as oil burners, CD players and air-conditioning. Rooms are comfortable with contemporary cane and timber furniture. Roll-away beds are available upon request. Rainforest Retreats are fan cooled. Surrounded by lush gardens and perfectly positioned to make the most of picturesque rainforest views. Including all of the features of a 1 Bedroom Apartment and located on the top floor of the resort, featuring a private rooftop area with a large Jacuzzi and BBQ. These rooms are superb for a romantic getaway or special occasion. Beachside Bliss! !!!!!! Position, Position, Position !!!!!! Welcome to one of Cairns City’s most exciting contemporary designed boutique motels. 4 star trendy accomodation in the Cairns CBD. The Aspect Central is ideally located on the corner of Sheridan and Grove Streets Cairns, only 800 metres north of the City CBD, 2 blocks from the Cairns Esplanade foreshore and a short 3km drive from both the Cairns Domestic and International Airport terminals. Live wild orchids, ferns, fan palm and native flora adorn the suites, Aspect Central provides a much sought after ambience and comfort that one would expect in Tropical North Queensland. The property is non smoking and offers convenience, privacy and comfort with attention to superior customer service. All guest rooms, conference facilities, restaurant and public areas at Aspect Central have access to the High Speed Wireless Broadband. On offer is a range of guest rooms for families, groups, singles and couples, all suites have quality bed linen, premium guest amenities and are comfortably furnished with the necessary facilities required to ensure that all guests have a comfortable and restful stay. Once inside, the unique elements of the building design are evident throughout, which helps to establish an overall feeling of well-being and uniqueness. Each room (over 30 individual character suites), has a modern and comfortable contemporary design that determines its own style and personality which has been created by the choice of furniture, layout and paint decoration. All rooms have been restyled recently with imported ceramic tiles and common area tableware. With the well equipped room facilities and the practical building layout, ease of access and free movement is created. The outdoor salt water reef style swimming pool creates a feeling of adventure and realism similar to the outer reef itself but on a much smaller scale. With coral, large clam, crab shells and many other reef ornaments tastefully on display around the poolside a fun and relaxing reef experience is assured. The Aspect Central is suited for business or leisure, popular with business clients, leisure guests, groups, government offices and families, who enjoy the escape to the comfort of the tastefully appointed guest rooms which are furnished to a standard one would expect, and are equipped with many lifestyle and business facilities. Most Tour operators pick up and drop off from the property daily and you will save a genuine 5% on all of your tour bookings when made at Aspect Central’s on site tour desk. Aspect Central’s on site food and beverage outlets are fully serviced by a well renowned team of award winning experts. The restaurant is open 7 days a week for Breakfast, Lunch and Dinner and offers a myriad of first class dining options from local fresh seafood choices to innovative local and international meals. The restaurant delivers authentic alfresco dining experiences with an emphasis on Western fusion specialties. Whilst the restaurant offers semi formal dining, the Café and Alfresco section is in a bright relaxed casual setting by the reef style pool. The lunchtime cafe provides selections of dining favourites that have truly stood the test of time. For family and business dining, the restaurant provides just the right atmosphere which is created by the design aspects of the building, together with the tastefully positioned furnishings and decorative finishes. For those that are on the go, lets not forget the fast moving take away and sit down smorgasbord of choices, which are located just across from Aspect Central on the eatery strip. Trendy design. Latest Touch button lighting. 4 star accomodation only 5 mins to Cairns City. The Executive Spa comprises 1 Queen bed, private ensuite bathroom, kitchenette, big flat screen colour TV, fully airconditioned, free Austar, in house movies, in room safe, work desk, hairdryer, ceiling fan, ironing equipment, fax/modem telephone line, free unlimited wireless broadband, mini bar, tea / coffee making. Rate is for 2 guests. Maximum occupancy is 2 guests. Trendy design. Premier Studio Suite, 4 star accomodation ideal for the budget minded traveler . Comprising 1 Queen bed, large private ensuite bathroom, fully airconditioned with big Flat screen colour TV, Free unlimited wireless broadband, free Austar, in house movies, safe, hairdryer, ceiling fan, microwave, coffee perculator, work desk, DVD & CD player, ironing equipment, fax/modem telephone line, mini bar, tea / coffee making. Rate is for 2 guests. Maximum occupancy is 2 guests. Open style, Trendy design. 4 star accomodation only 5 mins to Cairns City. The Escape Suite comprises 1 Queen bed, private ensuite bathroom, big 51cm TV, fully airconditioned, free Austar, in house movies, in room safe, work desk, hairdryer, ceiling fan, ironing equipment, fax/modem telephone line, Broadband Internet access(fee), mini bar, tea / coffee making. Rate is for 2 guests. Maximum occupancy is 2 guests.